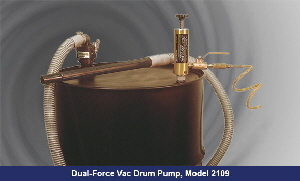 ITW Vortec has introduced the new Dual-Force Vac – a powerful yet economical two-way drum pump. Its all-new, patent pending design offers many unique features. The quiet and safe operation of this air-powered drum pump means no motor burn out and no shock hazard. 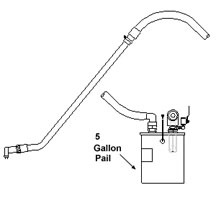 This high quality, dual mode drum pump is priced at or below other’s vacuum-only models. Using filtered compressed air, the heart of the Dual-Force Vac is ITW Vortec’s Transvector® air amplifier, which moves a large volume of air using a lesser amount of compressed air. 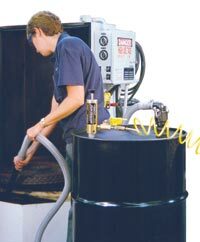 Electric driven vacuums frequently experience motor burnout from handling liquids. 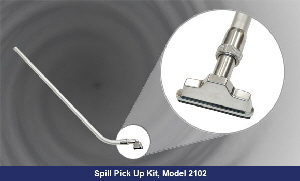 The Dual-Force Vac offers both safe and powerful vacuuming of fluids, as well as instant pump out capability.